Business Travel News, and other publications too, have battled hard in recent years for free internet access at hotels. Largely we have won, although there are some ludicrous cases including a major London rail terminus where the adjoining hotel charges and the train station is free. The coffee is more expensive in the hotel too. Cruise ships should make available free wi-fi. Virtually every ship has the guest facility. It is true that courtesy internet is offered by a select few but the charges levelled by some operators are over the top. Cruise ships’ technical and management staff are linked continuously on-line via satellite. Nothing extra is required. The passenger requirement will be small and not a problem from a practical point of view. We are talking about text and perhaps social media, but certainly not downloading films and the like. Wi-fi is one of those things people like to have available but will in fact make little use of. It is a facility. The latest to offer courtesy internet is Regent Seven Seas on particular grades of cabin and for returning guests meeting a certain criteria. It coincides with the completion of a multimillion-dollar upgrade to its fleet’s internet systems. These entail a doubling of available bandwidth to increase internet speed and reliability, and an expansion of the wi-fi system to provide connectivity throughout the entire ship, including all public spaces, outdoor decks and suites. Saga, as you will see below, offers free wi-fi as part of the package. Founded back in 1959, its name synonymous with retirees, Saga now is a London Stock Exchange listed company. 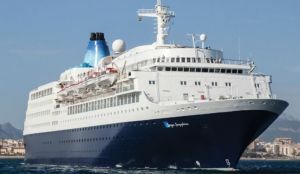 Perhaps the only notable point highlighted in a recent Business Travel News inspection of the Saga Sapphire cruise ship was the news that the company is looking into acquiring further tonnage in the not too distant future. Whether that means new-new, or new to the cruise line remains to be seen. Saga caters for the over 50s. No children on Saga expeditions. And no bunk beds either. There are 44 single cabins. Saga takes in just two ships Saga Sapphire (37,301/1447/706/1.7 - see below for our rating system) and Saga Pearl II (18,951/1348/456/1.8). Your Editor was invited for an overnight at Dover on Sapphire, the occasion a special ship visit opportunity to give prospective clients a "hands on experience" if they're nervous first time cruisers for example or have concerns that cruising is not for them. Guests paid from £129 each but that included ‘full board’ from lunchtime until after a very extensive breakfast including showtime and a ‘one off’ captain’s cocktail party. You could even take a swim in the indoor pool, not many ships equipped thus these days. Make a booking and the ship-stay comes off the price of your cruise. Saga Sapphire, just like its clients, is mature. Built in 1982 to the exacting standards of Hapag-Lloyd Cruises as Europa (the current Europa II tops the Berlitz list), it was for many years the pride of the German cruise industry. Acquired by Saga in 2010 it underwent an extensive refit and joined the fleet in 2012. For the most part the cabins are very generous space-wise and most have bath tubs. Your Editor (and wife) were accommodated in the Wellington Suite, compete with genuine Jacuzzi, bedroom and lounge/dining room. Guests on the overnight also took a ship’s tour. The Wellington Suite was included! A one day ship’s visit, and also an overnight, are always a rushed affair, impossible to take in the ambience of the vessel, or understand its nuances. We took in most of the ship including spa, sauna and steam rooms, various lounges, and the outdoor pool and Veranda buffet area. The Saga package includes chauffeur driven travel to and from the port (or free parking), no onboard gratuity or service charges, and the bar prices, in Sterling of course, seemed very reasonable. There is one sitting for dinner (if our evening meal was anything to go by the catering is first rate), and those with special dietary requirements are also looked after. The East to West is a no-charge option as is The Grill. There is 24-hour room service too. Over the next three months, up until the period just before Christmas there are some amazing cruise deals available. The specialists (and even your local travel agent) have block booked cabins and need to fill them. Or you can talk to a cruise company direct. The prices shown here are per person for double occupancy. An ‘on board’ service charge is added with some cruise lines. We show the tonnage, Berlitz rating (easily the best source for an informed unbiased ship review), passenger numbers, and passenger/staff ratio in that order. The overseas embarkation ports are all Fly-cruise. There is a selection of quality and size.